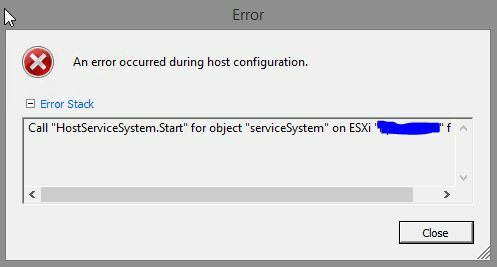 I participated in the vSphere 6.0 beta program and played with it in a couple test and development environments but haven’t had it in a clustered environment yet. Today, I installed the Dell customized image (VMware-VMvisor-Installer-6.0.0-2494585.x86_64-Dell_Customized-A00) on an M520 blade in a Dell VRTX chassis. The M520 is equipped with two Intel Xeon E5-2430’s and 64GB of RAM. There are two of these M520 blades in the chassis as well as an M620 blade with two Intel Xeon E5-2680’s and 256GB of RAM installed. Getting ESXi 6.0 on the two M520’s is the first step to setting up this 6.0 cluster, as some crafty migration will need to be used since the VRTX is using the shared PERC 8 and there’s a couple VMs that need to remain up. Part of that migration will involve moving some VMs over to the production clusters we have and flashing the PERC firmware to the latest in order to support write-back cache… but that’s another story. 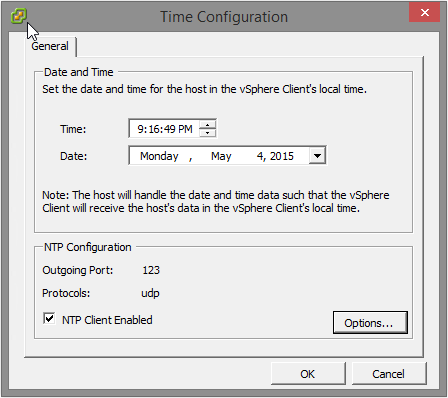 As usual, one of the first things I configure on a host is the NTP settings. 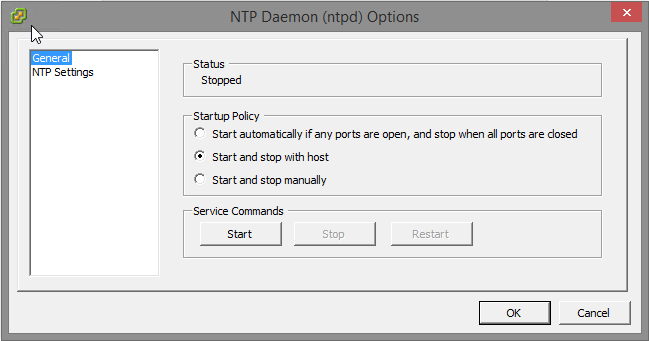 I usually just enable NTP to start and stop with the host and set the NTP server to pool.ntp.org – pretty simple. However, that didn’t go as well as I had expected. Glad I am not the only one to have experienced this. I couldn’t find many others with the issue. 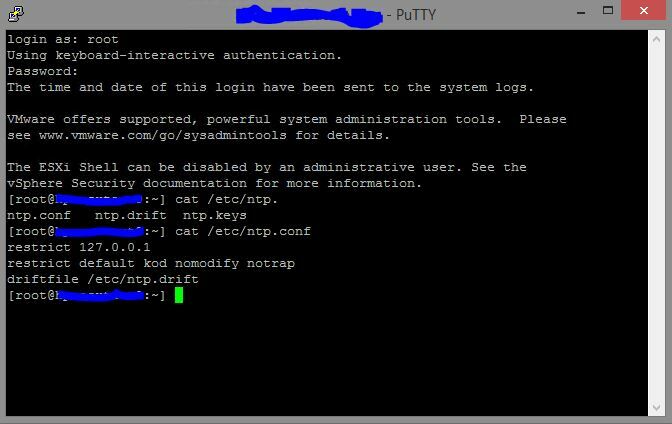 I just installed 6.0 U1 on a TS140 and configured NTP just as you would (start/stop with host and pointed to pool.ntp.org) and didn’t have any issues (using the vSphere c# client), so perhaps it is fixed. I did install the two patches subsequent to U1, so I don’t know if that had anything to do with it. It’s a little pokey, my Samsung EVO SSD and extra RAM got here, but Amazon is back ordered on the E3-1246, so I’m running on an i3-4130 right now. BTW, nice to drop in a stock ESX installer and have it work flawlessly on the TS140. I used to do pretty much nothing but VMWare work, but then I went to work for their competition, so this is the first time I’ve touched it in 5 years or so – the trouble free install was welcome. Great website – I do enjoy reading through it – thanks. Thanks for the comment Bruce – glad to hear it’s working well for you. I recently deployed a 6.0 Update 1 host and did have the issue with NTP again. It seems temperamental. I found that if I edit one of the NTP config files it works fine – oh well.